Americans believe in four very different, incompatible conceptions of God. At least three of the God types listed above are false. Most American adults believe in a type of God who is non-existent. Faith groups have been doing a poor job at education. Prayer appears to be ineffective in assessing the nature of God. If it did work, then it would seem likely that essentially all believers in God would quickly gravitate away from at least three of the four Gods to the most accurate viewpoint. This conclusion is in harmony with the results of a pilot study among this Webster's visitors. That study showed that believers cannot assess the will of God through prayer. There is a phenomenal opportunity for any merchandising expert who would be willing to take on the task of "selling" Deism to the U.S. public. Deism is more a belief about God than a religion. Many Deists believe that God created the universe and the laws of nature, kick started it into operation, left, and hasn't been involved in the affairs of humans or of the rest of the universe ever since. In other words, they believe in a very distant god who is removed from worldly and personal affairs. 23.7% of the subjects strongly agreed or agreed that God is removed from worldly affairs." 35.0% strongly disagreed or disagreed that God is directly involved in worldly affairs." 20.9% strongly agreed or agreed that God is removed from their personal affairs." 30.5% strongly disagreed or disagreed that God is directly involved in their personal affairs." Thus, substantial minorities of U.S. adults hold beliefs about God that are very different from what they might hear in church. Rodney Stark, "What Americans really believe," Baylor University Press; illustrated edition edition (2008). Read reviews or order this book safely from Amazon.com online book store. Available in Kindle format for $13.61 and in paperback for $20.92 plus shipping. "A shocking snapshot of the most current impulses in American religion. Rodney Stark reports the surprising findings of the 2007 Baylor Surveys of Religion, a follow up to the 2005 survey revealing most Americans believe in God or a higher power. This new volume highlights even more hot-button issues of religious life in our country. A must-read for anyone interested in Americans' religious beliefs and practices." 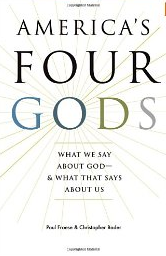 Paul Froese & Christopher Bader, "America's Four Gods: What We Say about God--and What That Says about Us," Oxford University Press, (2010) Read reviews or order this book safely from Amazon.com online book store. Available in Kindle format for $13.61 and in paperback for $20.92 plus shipping. "Using conclusions drawn from the Baylor Religion Survey first published in 2006, these two Baylor University professors expound on their thesis that Americans' view of God can be characterized as one of four basic types: authoritarian, benevolent, critical, and distant. By knowing which of the four types of God an American believes in, these scholars can predict that person's views on many of the pressing issues facing the country. As an antidote to the prevailing but simplistic dichotomy between religious and nonreligious Americans, this thesis is far more nuanced and satisfying. But it, too, has its limitations. It's not clear that people stick to one view their whole lives, and it doesn't fully account for the views of those who occupy middle ground, somewhere between a judgmental and forgiving God. Still, the fourfold God typology is a step toward better understanding how Americans regard morality, how they understand the presence of evil, and what meta-narrative they tell about their lives.